Q. A warning on my statin prescription tells me not to drink grapefruit juice or eat grapefruit. Does this mean I can never enjoy this delicious fruit again? A. I can understand your disappointment at this double whammy. Here’s some news I hope will at least partly cheer you up: You don’t have to give up grapefruit forever as long as you (and your doctor) are willing to switch to a statin or other cholesterol-lowering agent that isn’t affected by grapefruit juice. Grapefruit juice and grapefruit itself can boost blood levels of some statins and a variety of other drugs (see table). Something in grapefruit — scientists aren’t yet sure what — latches onto an enzyme in the intestines called CYP3A4. This enzyme partially breaks down some drugs, so knocking it out of action means more of the drugs get into the bloodstream. In the case of statins, abnormally high blood levels can damage muscles or the liver. Grapefruit and grapefruit juice can boost blood levels of several prescription medications. Keep in mind that each category contains several other medications that aren’t affected by grapefruit. 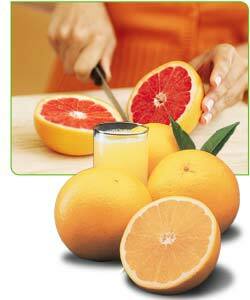 One glass of grapefruit juice is enough to suppress CYP3A4 activity by half, and the effect lasts for 12–24 hours. Switch to orange juice. It doesn’t affect CYP3A4, and so won’t boost blood levels of your statin. If you are taking only a low dose of a statin, you can probably get away with the occasional small glass of grapefruit juice or half a grapefruit. Don’t do this if you are taking a high dose. Switch to pravastatin (Pravachol, generic), which the body breaks down via a route that doesn’t involve CYP3A4. Rosuvastatin (Crestor) and fluvastatin (Lescol) are broken down by a cousin of CYP3A4, which is less affected by grapefruit. Ezetimibe (Zetia), colesevelam (WelChol), and niacin are other cholesterol-lowering options that work safely with grapefruit. If you can’t start the day without a glass of grapefruit juice or a juicy half-grapefruit, check to make sure you aren’t taking other medications affected by this citrus fruit. If you are, your doctor can steer you to safer alternatives. The University of Florida has set up a Web site (www.druginteractioncenter.org) where you can see if your medications interact with grapefruit. In the lab, pomegranate juice and star-fruit juice also block CYP3AY. Whether they increase drug levels in the body isn’t known. Patients often are warned against taking certain pills with grapefruit juice, which can turn normal doses of a drug into a toxic overdose. Now, researchers have raised a new concern: grapefruit, orange and apple juices may also block the effects of some drugs, wiping out any potential benefit to patients, according to a new study. Healthy volunteers took a dose of the allergy drug fexofenadine, downing it with water or juice. When the drug was taken with grapefruit juice, for instance, only half of the dose was absorbed into the bloodstream, compared to taking it with water. The findings were presented this week at the national meeting of the American Chemical Society by researchers at the University of Western Ontario in London, Ontario. So far, the investigators have found that grapefruit, orange and apple juices reduce absorption of the anticancer drug etoposide; certain beta blockers used to treat high blood pressure; cyclosporine, used to prevent rejection of transplanted organs; and certain antibiotics. Additional drugs are likely to be added to the list, said David G. Bailey, a professor of clinical pharmacology at the University of Western Ontario. It was Dr. Bailey who originally identified the potential harm in consuming medications with grapefruit juice, showing that it can interact with drugs in a way that raises blood concentration of the medication to dangerous levels. It’s known to affect about 50 drugs, ranging from cholesterol-lowering statins to Viagra. Some drugs now carry labels warning consumers against taking them with grapefruit juice or fresh grapefruit. Dr. Bailey said patients should consult with their doctors or pharmacists before taking any medications with grapefruit or other juices. The best advice, however, is to take most medications only with water. People taking the blood thinner warfarin may have a higher risk of excessive bleeding or blood clots when using supplements containing gingko, garlic, and fish oil, a study found. Many over-the-counter pills change the effectiveness of warfarin, marketed under the brand name Coumadin by Bristol-Myers Squibb, the research showed. Cranberry and glucosamine, for example, make the medication more potent, while ginseng and green tea extract make it too weak and ineffective at preventing clots in blood vessels. Doctors consider warfarin difficult to manage because of side effects such as bleeding, and scientists have known that some popular health aids may cause adverse reactions when taken with prescription medicines. Doctors should ask their patients about any supplements they may be taking before prescribing the blood thinner so that they can adjust the dose or take other precautions, according to the study. Americans increasingly view the food they eat as medicine to help lower cholesterol, reduce high blood pressure and control blood sugar. But as with prescribed drugs, the health-improving qualities of foods such as olive oil, nuts and fruit can interact with other medications, causing possible problems. Pharmacists often warn people not to mix anti-cholesterol drugs known as statins with grapefruit juice. Newer research suggests that other fruit juices, including cranberry and pomegranate, as well as olive oil may also interfere with how statins work in the body. Other laboratory studies show that certain popular teas can block the effect of some medications, including the flu drug Tamiflu. And switching to a low-fat diet, itself a healthy lifestyle change, could reduce the potency of some medications. Diet can interact with medicine in two main ways. Some foods block the body's ability to absorb certain medications, effectively reducing the dose a person receives. Other foods enhance the absorption of some drugs, which can lead to a possible overdose. In general, diet will only interact with medications when a person is consuming exceptionally large portions of certain foods, pharmacology and medical experts say. A few teaspoons of olive oil on pasta typically doesn't pose any problems, for instance. Still, as Americans increasingly select foods based on their health benefits, or take supplements with high doses of nutrients, the likelihood of adverse interactions with medications rises. U.S. sales of supplements, natural and organic foods and functional foods, or foods enhanced beyond normal use like calcium-fortified orange juice, grew to $93.5 billion in 2008 from $47.9 billion in 2000, according to Nutrition Business Journal, a nutrition-industry trade publication. "For every drug there is, there are unintended side effects. You should expect the same thing when taking nutrients at drug levels," says Patrick Stover, director of the division of nutritional sciences at Cornell University in Ithaca, N.Y.
Other factors also can affect how medicines are absorbed in the body, including a person's age, weight and gender. Such variations, combined with possible interactions with the food we eat, can increase or reduce the effective dose of a medication by as much as 5- to 10-fold, which are "huge effects," Dr. Stover says. Grapefruit is one of the most extensively studied foods for its impact on medication. Compounds in the fruit can increase the potency of statins and other medications to potentially dangerous levels by inhibiting cytochrome P450, a family of enzymes that break down the drug. Research indicates that drinking just one eight-ounce cup of grapefruit juice a day increases the strength of the drug. Recently, animal and laboratory studies have suggested that other fruits, including pomegranates, oranges (especially those from Seville), cranberries, grapes and black mulberries, could have a similar, although less robust, effect on statins in the body. Pomegranates and cranberries are frequently touted as healthy foods because of their high quantities of antioxidants, which supposedly remove free radicals from the body and slow the onset of disease and aging. Some foods appear to reduce the effectiveness of certain medications. In the lab, some scientists' work raises similar concern about olive oil and some statins. The oil, a principal part of the Mediterranean diet and believed to lower the risk of heart disease, also appears to contain compounds that inhibit the drug's breakdown, according to researchers in Spain. The effects of olive oil likely aren't as strong as that of grapefruit, but more studies are needed to figure out what quantities might actually impact humans, say experts. John Thor Arnason, a biologist at the University of Ottawa, and his colleague Brian Foster of Health Canada, a government ministry, have investigated the effect on drugs of more than 450 food products, mainly in animal and laboratory studies. The scientists continue to study potential food-drug interactions, as do other researchers world-wide. In one recent study, Dr. Arnason's team examined dozens of different kinds of beers. They found that the "hoppier" or more bitter beers reduced the effect of the cancer drug Tamoxifen, when compared with beers that were less hopped. The study was published this year in the Journal of Agricultural and Food Chemistry. Another popular compound, the anti-oxidant resveratrol found in red wine, nuts and dark chocolate, is touted for its anti-aging benefits. But resveratrol in large quantities appears to potentially enhance the potency of drugs, other laboratory studies show. People, especially older adults taking multiple medications, should tell their doctor about dietary supplements, if they are using high-potency juices and teas and drinking lots of wine, Dr. Arnason says. He says that drugs whose labels contain lots of conditions and warnings about possible interactions with other medications are probably more likely also to interact with foods. If a food-drug interaction is suspected, patients should stop taking the food and talk to their doctor immediately. In work published this year, Drs. Arnason and Foster showed that various herbs including chai hu, Labrador tea, echinacea and goldenseal, can reduce the potency of Tamiflu. The researchers incubated Tamiflu by itself or along with herbs, together with human liver tissue, which is responsible for processing the medication in the body. They found that the drug was less activated in the presence of the herbs. The herbs are believed to proffer different health benefits. Labrador tea is thought to benefit the nervous system, Chai Hu to treat common cold and fever, and Echinacea is thought to prevent colds and have anti-tumor benefits. Goldenseal is an anti-microbial and anti-inflammatory product. The researchers also have studied black tea, which is touted for lowering blood pressure, and found that it appears to inhibit an enzyme responsible for the body's processing of many drugs. The result, the researchers found, is that consuming large quantities of black tea could potentially increase the potency of a wide range of medications. Others researchers have investigated spices. In one study, piperine, one of the main components of black pepper, increased the potency of the antihistamine Allegra in rats by two-fold compared with animals that took the medicine alone, according to a report in April's Journal of Food Sciences. Much of the research on teas and other foodstuffs—with the exception of grapefruit—haven't been well-studied in humans, so the exact amount that may cause a harmful effect isn't yet known, say researchers. Whether the alcohol from beer or wine affects the processing of other drugs isn't clear, says Cynthia Kuhn, a professor of pharmacology at Duke University Medical Center. It is dangerous to use alcohol in combination with sedating drugs like antihistamines, or narcotic pain medicines, because of the additive effect in the brain. But despite strong warnings on some other drug labels that alcohol can interact in the liver to inhibit metabolism of other medications, the evidence "is not strong," says Dr. Kuhn. Alcohol is mainly metabolized by an enzyme called alcohol dehydrogenase, which "has nothing to do with the metabolism of most drugs," she says. Some drugs, like dilantin, an epilepsy medication, appear to be affected by the amount of fat in the diet, according to a 2004 study. Such medicines are dissolved only in fats and could therefore become less effective by a significant reduction in fat consumption. Experts suggest that patients considering major dietary changes, such as switching to a much lower fat diet from a high-fat one, should discuss the move with their doctor. The patient didn't overdose on medication. She overdosed on grapefruit juice. The 42-year-old was barely responding when her husband brought her to the emergency room. Her heart rate was slowing, and her blood pressure was falling. Doctors had to insert a breathing tube, and then a pacemaker, to revive her. They were mystified: The patient's husband said she suffered from migraines and was taking a blood pressure drug called verapamil to help prevent the headaches. But blood tests showed she had an alarming amount of the drug in her system, five times the safe level. Did she overdose? Was she trying to commit suicide? It was only after she recovered that doctors were able to piece the story together. "The culprit was grapefruit juice," said Dr. Unni Pillai, a nephrologist in St. Louis, Mo., who treated the woman several years ago and later published a case report. "She loved grapefruit juice, and she had such a bad migraine, with nausea and vomiting, that she could not tolerate anything else." The previous week, she had been subsisting mainly on grapefruit juice. Then she took verapamil, one of dozens of drugs whose potency is dramatically increased if taken with grapefruit. In her case, the interaction was life-threatening. "What drove us to write this paper was the number of new drugs that have come out in the last four years," said Dr. Bailey, a clinical pharmacologist at the Lawson Health Research Institute, who first discovered the interaction by accident in the 1990s. How often such reactions occur, however, and how often they are triggered in people consuming regular amounts of juice is debated by scientists. Dr. Bailey believes many cases are missed because doctors don't think to ask if patients are consuming grapefruit or grapefruit juice. Even if such incidents are rare, Dr. Bailey argued, they are predictable and entirely avoidable. Many hospitals no longer serve juice, and some prescriptions carry stickers warning patients to avoid grapefruit. "The bottom line is that even if the frequency is low, the consequences can be dire," he said. "Why do we have to have a body count before we make changes?" For 43 of the 85 drugs now on the list, consumption with grapefruit can be life-threatening, Dr. Bailey said. Many are linked to an increase in heart rhythm, known as torsade de pointes, that can lead to death. It can occur even without underlying heart disease and has been seen in patients taking certain anticancer agents, erythromycin and other anti-infective drugs, some cardiovascular drugs like quinidine, the antipsychotics lurasidone and ziprasidone, gastrointestinal agents cisapride and domperidone, and solifenacin, used to treat overactive bladders. Taken with grapefruit, other drugs like fentanyl, oxycodone and methadone can cause fatal respiratory depression. The interaction also can be caused by other citrus fruits, including Seville oranges, limes and pomelos; one published case report has suggested that pomegranate may increase the potency of certain drugs. Older people may be more vulnerable, because they are more likely to be both taking medications and drinking more grapefruit juice. The body's ability to cope with drugs also weakens with age, experts say. Under normal circumstances, the drugs are metabolized in the gastrointestinal tract, and relatively little is absorbed, because an enzyme in the gut called CYP3A4 deactivates them. But grapefruit contains natural chemicals called furanocoumarins, that inhibit the enzyme, and without it the gut absorbs much more of a drug and blood levels rise dramatically. For example, someone taking simvastatin (brand name Zocor) who also drinks a small 200-milliliter, or 6.7 ounces, glass of grapefruit juice once a day for three days could see blood levels of the drug triple, increasing the risk for rhabdomyolysis, a breakdown of muscle that can cause kidney damage. Estradiol and ethinyl estradiol, forms of estrogen used in oral contraceptives and hormone replacement, also interact with grapefruit juice. In one case in the journal Lancet, a 42-year-old woman taking the birth control pill Yaz developed a very serious clot that threatened her leg several days after she started eating just one grapefruit a day, said Dr. Lucinda Grande, a physician in Lacey, Wash., and an author of the case report. But Dr. Grande also noted that the patient had other risk factors and the circumstances were unusual. "The reason we published it as a case report was because it was so uncommon," she said. "We need to be careful not to exaggerate this." Some drugs that have a narrow "therapeutic range" - where having a bit too much or too little can have serious consequences - require vigilance with regard to grapefruit, said Patrick McDonnell, clinical professor of pharmacy practice at Temple University. These include immunosuppressant agents like cyclosporine that are taken by transplant patients to prevent rejection of a donor organ, he said. Still, Dr. McDonnell added, most patients suffering adverse reactions are consuming large amounts of grapefruit. "There's a difference between an occasional section of grapefruit and someone drinking 16 ounces of grapefruit juice a day," he said. And, he cautioned, "Not all drugs in the same class respond the same way." While some statins are affected by grapefruit, for instance, others are not. ¶ If you take oral medication of any kind, check the list to see if it interacts with grapefruit. Make sure you understand the potential side effects of an interaction; if they are life-threatening or could cause permanent injury, avoid grapefruit altogether. Some drugs, such as clopidogrel, may be less effective when taken with grapefruit. ¶ If you take one of the listed drugs a regular basis, keep in mind that you may want to avoid grapefruit, as well as pomelo, lime and marmalade. Be on the lookout for symptoms that could be side effects of the drug. If you are on statins, this could be unusual muscle soreness. ¶It is not enough to avoid taking your medicine at the same time as grapefruit. You must avoid consuming grapefruit the whole period that you are on the medication. ¶In general, it is a good idea to avoid sudden dramatic changes in diet and extreme diets that rely on a narrow group of foods. If you can't live without grapefruit, ask your doctor if there's an alternative drug for you. Q. Does grapefruit juice affect levothyroxine effectiveness? A. There are about 100 drugs that can have dangerous and even life-threatening effects if you eat grapefruit or drink grapefruit juice while taking them, but levothyroxine, a thyroid hormone drug used to treat an underactive thyroid, is not one of them. Grapefruit juice may, however, slightly reduce the body’s ability to absorb the drug, so if you often drink grapefruit juice, levothyroxine levels may be lower than normal, impairing treatment. Dozens of other medications — including commonly used drugs like certain statins, some new non-warfarin oral blood thinners, opioids like oxycodone, oral fentanyl, methadone and some cancer drugs — can be extremely dangerous if you drink grapefruit juice, said Dr. David Bailey, a professor emeritus of clinical pharmacology who first described the interaction and periodically updates a list of affected drugs maintained by the Canadian Pharmacists Association. “You don’t have to drink liters and liters of the stuff to have an effect,” Dr. Bailey said. For example, he said, “if you take simvastatin and drink a single glass of grapefruit juice, it’s like taking three times the dose,” though the impact can be much more or much less, since individual susceptibilities vary widely. “Despite the concern for toxicity, which can be very serious in some cases, just exposure to grapefruit juice will not likely produce an adverse clinical reaction in most patients,” Dr. Bailey said. “The greatest hazards may come from consuming grapefruit repeatedly during the day, which can cause a further increase in blood levels of affected drugs.” Other citrus fruits like Seville oranges, limes and pomelos can also produce a similar effect. Additional drugs affected by grapefruit are some AIDS medications, certain birth control pills and estrogen treatments, antihistamines, Viagra, some heart drugs like quinidine, certain antipsychotics and gastrointestinal agents, some immunosuppressant drugs and some blood pressure drugs. Under normal circumstances, these drugs are metabolized in the gastrointestinal tract, where an enzyme called CYP3A4 deactivates them, so relatively little of the active ingredient is absorbed. But grapefruit contains natural chemicals called furanocoumarins that inhibit the enzyme, and without it the gut absorbs much more of the drug, causing blood levels to spike. The result can be kidney failure, fatal respiratory depression, gastrointestinal bleeding or a life-threatening heart arrhythmia, depending on the person and the drug. The effect of grapefruit on levothyroxine is the opposite: Drinking grapefruit juice — or orange juice — can inhibit uptake transporters and reduce the drug’s absorption. The effect does not last as long, but can lead to under-treatment of the thyroid condition. Levothyroxine tablets should be taken only with water and on an empty stomach first thing in the morning, and you should wait a full hour before eating or drinking anything else, said Dr. James Hennessey, director of clinical endocrinology at Beth Israel Deaconess Medical Center in Boston. “Anything but water can potentially lead to malabsorption of levothyroxine,” he said. Supplements and other drugs can also interfere with absorption. You should wait at least four hours after taking levothyroxine before taking antacids or vitamins or supplements containing iron or calcium. Regular consumption of foods that contain soy, walnuts or dietary fiber can also reduce the absorption of levothyroxine. If you’re concerned about whether you are achieving the right blood levels of a medication, check with your doctor to see if your dose needs adjustment.